The day started with an early morning assembly in the central patio courtyard of Canterbury’s Lower School on Snell Isle. Moms and dads stood patiently with grade-schoolers in uniforms. 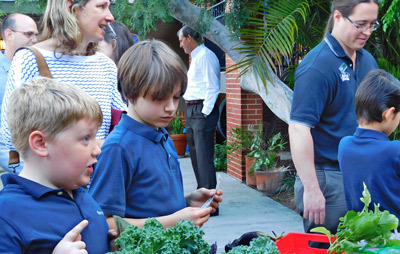 First came the Pledge of Allegiance and achievement awards, then the highlight of the morning – a student-run farmer’s market with bright red radishes, kale, lettuces, herbs, and cherry tomatoes for sale. It was a bounty from the school’s new STEAM garden. The inspiration of Breck Moorefield, Canterbury’s art teacher, the garden is a several-year project that came together late last year, thanks to a big helping hand from Nic Weathersbee of Urban Micro Farms who provided professional advice on just about everything: organic garden design, tools, hauling tree stumps and branches, digging out the beds and filling them with soil, ordering seeds and picking out plants and seeds, planting them, and teaching the students all necessary garden know-how. “We blended my vision and Nic’s knowledge,” says Breck, whose enthusiasm for teaching, gardens, art, and children is infectious. From a neglected patch of sandy soil in the back corner near the playground, there is now a peaceful outdoor space for kids to read, play, sit quietly, and learn about nature and science. A tepee made from palm fronds shades a meandering sidewalk. A small chicken coop off to one side waits for new residents. Squash blossoms are flowering. Carrots, basil, lettuce, kale, onions, aloe, strawberries, cherry tomatoes, and cranberry hibiscus are growing. 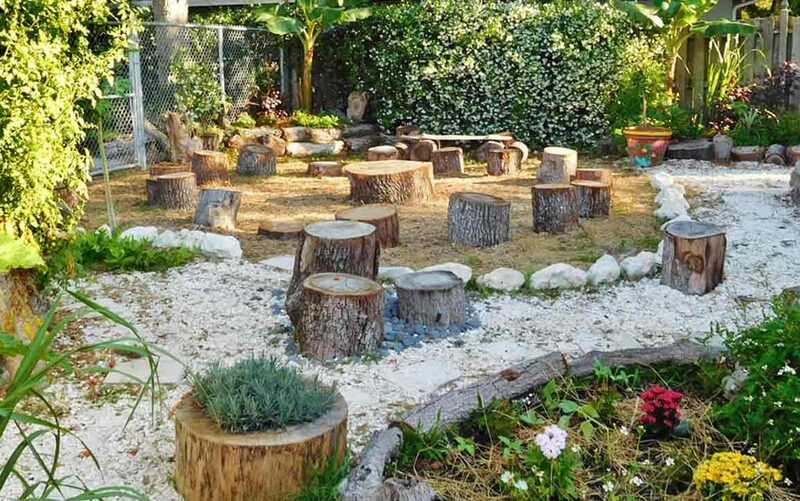 Big tree stumps sit in a circle, providing a rustic place to hang out. A chalk wall overlooks an old-fashioned hopscotch game. It’s definitely a magical place. 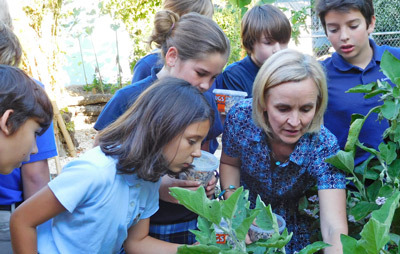 STEAM stands for science, technology, engineering, art and math, and the STEAM garden is an opportunity to study those topics in an outdoor classroom, says Breck. 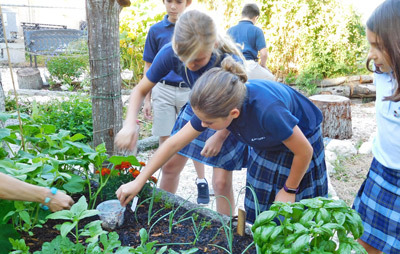 This school year, activities have included cultivating soil using organic materials and earthworms, learning about pollination, and watching the lifecycle of butterflies, starting with cocoons that hung from the squash and tomato vines. This summer, the science lessons will be taken one step further with the installation of an aquaponics feature, paid for through the school’s marine science program. The idea is to cultivate fish, which will produce waste that microbes and worms can convert to fertilizer for the plants; then the plants filter water that returns to the fish. Art teacher Breck Moorefield demonstrates how to release the ladybugs. The exciting lesson of the day during my visit was the release of dozens of ladybugs into the garden. Ladybugs are toxic to would-be predators. It’s an eco-friendly, non-chemical way to keep the pest population under control, says Breck. Students crowd around as she shows them how to lift the containers and encourage the tiny ladybugs, still a little dazed from being in the refrigerator, to crawl onto the plants and start doing their job. Outdoor nature lesson ended, the students filed back into the classroom, where they used markers to draw big red ladybugs on folded pieces of paper. It was the perfect way to make the connection between art, nature, and science – and the perfect way to end my visit. 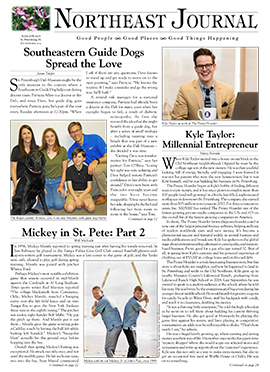 What a great article! I’m very proud of everyone at Canterbury! My heart and soul went into my work there, I loved every minute.